In Moscow lovers of the films “Interstellar” and “Gravity” can begin their space tour as soon as they arrive by staying at the Cosmos Hotel, located in what could be called the “space” part of town. From there they can cross the street to the Cosmos Pavilion at VDNKh and the Moscow Museum of Cosmonautics. Choose the planetarium that fits you best: a fancy one full of wild amusements or a small and cosy Soviet one hidden among the trees of Ekaterininsky Park. For a tour of Zvezdny Gorodok (Star Village) reservations often must be made two months in advance. At the end of World War II it was still unknown if a living being could survive a space flight. In the USSR, given Professor Pavlov’s previous experience, experiments went forward with dogs, while in the U.S. and France scientists chose monkeys and cats respectively. In the USSR dogs were taken from shelters, as family dogs were considered too soft. Scientists needed dogs with a real “Soviet character,” in other words tough and full of self-denial. In August 1960 Belka and Strelka accomplished 17 orbits around the Earth and their comeback was a triumph. They spent the rest of their lives in glory, and were often paraded around in kindergartens and schools. When they died their bodies were stuffed with straw and put on display at the Museum of Cosmonautics in Moscow. Nikita Khrushchev gave Pushinka, a puppy of the heroine Strelka, as a gift to President Kennedy’s daughter. The gift was intended as a hint: the First Secretary of the Communist Party wanted to demonstrate that the USSR had beaten the U.S. in the space race. Once the CIA checked it for listening devices, Pushinka became the Kennedys’ pet, soon pairing it off with their Welsh terrier Charlie. She gave birth to four puppies. 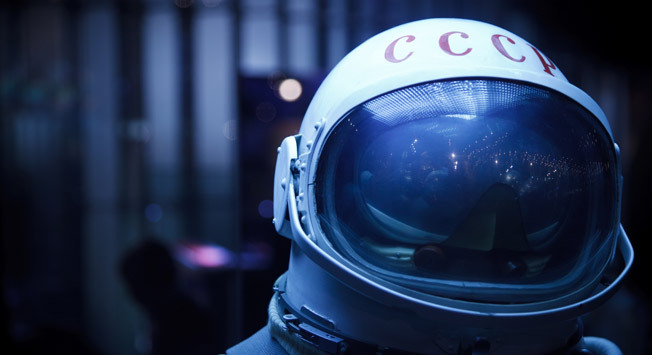 The museum has a rich collection including the first satellite, a space WC, the capsule where space dogs Kozyavka and Otvazhnaya lived, the personal belongings of the first astronaut, specimens from the moon and recreations of space flights. Authentic space food is sold in the gift shop. Everything has been left untouched at Korolev’s Memorial House Museum located nearby. He lived there for six years during an intense period of work, fully devoting himself to projects aimed at conquering space, the most important of which was the launch of the Earth’s first artificial satellite and the first space flight of a man. The Astronauts’ Training Center and the Museum of Space Exploration can be found at the closed settlement Zvezdny Gorodok. Here you can learn about the history of spacecraft, see the first Soviet rocket, spacesuits and flight simulators for the training of astronauts. If you submit to a quick medical check-up, you can try all this yourself. But strolling around the grounds through this quiet town is also worthwhile as it’s a fascinating glimpse into Soviet scientific settlements. In order to visit the museum, you need to book a tour by phone or e-mail at least 35 days in advance. The Moscow Planetarium was recently reconstructed and has once again become a major destination for entertainment mixed with a scientific and educational mission. There are Large and Small Star Halls, the Lunarium interactive museum, a 4D cinema and an observatory. The Cosmos Pavilion Museum at VDNKh park features a full-size interactive model of the future Mars-Tefo space station. It is part educational project and part interactive museum dedicated to the exploration of Mars. It is also a place where you can experience the role of the astronaut and explorer of distant worlds. There are three ways to experience Mars-Tefo: you can look, touch or try yourself. Visitors can get on a simulator that mimics a walk on the surface of Mars with views of its landscapes. The walk leads to the station, where you can observe sandstorms. There are fantastic images of Mars’ surface as well as a panorama of the Gale Crater shot by the Curiosity space probe in 2012. Additionally, visitors can enter the teleport zone and go into the future to a time when humans can explore Mars and a screening room where you can see Mars and a film on the exploration and conquest of the Red Planet. For more information on space sites near Moscow check our story about Kaluga, the cradle of space exploration.